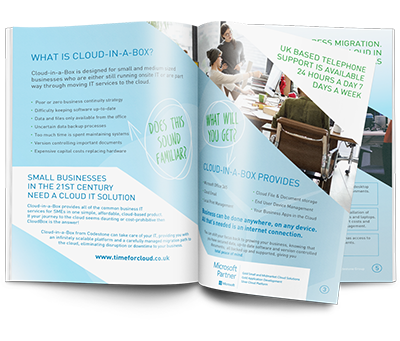 Cloud-in-a-Box provides all of the common business IT services in one simple, affordable, cloud-based product. Access all of your critical business apps and data from anywhere, on any device. Cloud back-up of data and documents keeps your business working when disaster strikes. Reduce IT costs with professionally managed software and hardware. Move from a CapEx to an OpEx IT model. Manage all your IT Services in one centralised place. Standardise your desktop and mobile environments. 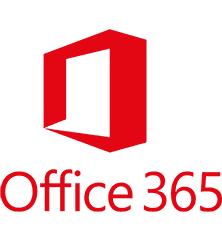 Leverage the power and simplicity of Microsoft Office 365 for core services. Benefit from enterprise class security at a fraction of the cost. Fast Track your evaluation of Cloud-in-a-Box by chatting to one of our experts. What Cloud-in-a-Box can do for your business with our eBook outlining the key capabilities and value. Preconfigured services allow us to plug Cloud-in-a-Box into your network and seamlessly connect your users to your cloud services. Run your business apps from an enterprise-class datacentre alongside your file and document based information. Leverage Office 365 for core productivity services and manage your devices and local printing. Microsoft’s market-leading cloud-based email, collaboration and productivity services. Migrating to the cloud with Cloud-in-a-Box is easy and so is our pricing – no nonsense; per-user per-month. Simply fill in the form to get a quote. Still running accounts or CRM software ‘on premise’? With Cloud-in-a-Box we migrate these to the cloud – safe, secure and accessible from anywhere. Cloud document storage enables a single version to be available to all your staff, wherever they are. Market-leading security, backup and virus protection are all included in Cloud-in-a-Box. Codestone is accredited to ISO9001 and ISO27001 ensuring your system is in safe hands. Migration of your on-premise applications and services is included in Cloud-in-a-Box and in your monthly fee. There are no upfront costs for migration. Also included is Cloud-in-a-Box Support, 24x7x365 from our UK service centre – if you need us we’re on hand.